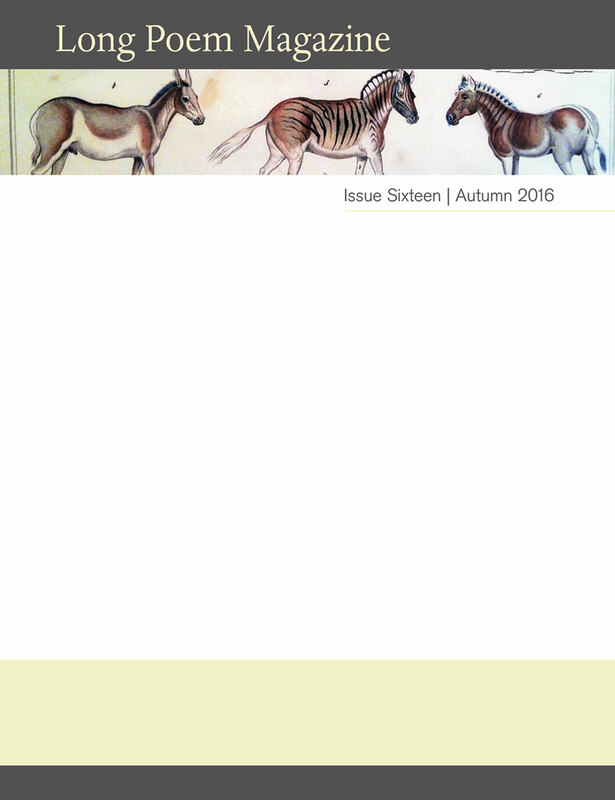 Long Poem Magazine travels vast distances and represents many nationalities. In this issue we venture into our beloved Europe where Anna Kisby ‘ventriloquises’ French/Mexican poet and artist Alice Rahon in 1920s Roscoff, a commune in Finistère, Brittany. Amy Wack conjures her seven untamed cats in the town of Válor on the edge of the Sierra Nevada mountains in Andalusia, Spain, and Robert Vas Dias echoes ‘Bashō with a hybrid haibun written during a week in the Val d’Orcia’, Tuscany. A sense of displacement leads Michael Curtis to develop a fictional character roaming the streets of Kotor, Montenegro (currently negotiating to join the European Union). Helen Moore writes from a residency in Somerset’s Selwood (Sealhwudu) forest, where, on the same day as the Brexit vote was announced, a decision was made to fell the town centre’s most ancient tree. Oleg Chukhontsev’s Russian-German protagonist descends from the time Germans were invited into the Volga steppe by Catherine the Great in the 1760s; in 1941 many were deported to Kazakhstan only to be allowed back to European Russia in the 1960s. For Aidan Semmens ‘language breaks down at the borders/ of time and geography’ – his forthcoming collection is scheduled for publication next year, the centenary of the Russian Revolution. The long poem provides less of a snapshot, an instant, a momentary occasion, more of an opening up and out, a continuum. In her essay exploring long poems of the Caribbean, Vahni Capildeo recalls from her early life in Trinidad, a calendar with reproductions of Walcott paintings, referring to such images as a way into ‘the imaginative worlds of long poems’. Dragan Jovanović Danilov speaks of Belgrade as his ‘inner city’, his ‘dream dictionary, a catalog of collective subconscious, a unique encyclopedia…’; his imaginative writing process as ‘almost painting-like.’ Kazakh poet Ulugbek Yesdaulet writes of a real painting in his home country and its imaginary powers, the sight of which ‘scared him to death’. Mark Goodwin’s borderless fairytale ‘hovering somewhere amongst our world’s regions of loss.’, was informed by a piece of music written in Romania by composer Alexandru Hegyesi. French-Norwegian poet Caroline Bergvall, a resident of London, champions the courageous Mexican writer Sanjuana Martínez Montemayor, whose criticism of government has led to her living under constant threat. Hannah Lowe introduces us to the Caribbean/Indian dialogue of Mishra and Chan, two immigrants ‘drawn together to play cards and lament their lives’. Eduardo Moga, a Spanish poet writes as a lone man ‘lonely as his shadow, /as his unruly hat’, walking the night streets by Battersea Park. And Stratford-on-Avon with Timothy Adès’ ‘old Will’ is not a bad place to end up!